On Tuesday (June 5), Venus will trek across the sun's face from Earth's perspective, marking the last such transit of Venus until 2117. In a sort of celestial warmup, the full moon will dive through the Earth's shadow on Monday morning to produce a partial lunar eclipse that will be visible to observers throughout parts of North America, Asia and the Pacific region, weather permitting. The eclipse begins in earnest at 6 a.m. EDT (1000 GMT), when the moon first contacts the umbra, the dark inner portion of Earth's shadow. The umbra might appear dark and relatively colorless to the naked eye, but binoculars or a telescope may show it glowing dimly orange, red or brown. The eclipse peaks at 7:04 a.m. EDT (1104 GMT), when 37 percent of the moon will be in shadow, and ends an hour later, at 8:06 a.m. EDT (1206 GMT). Observers in Europe will miss out on Monday's lunar eclipse, as will part of the United States East Coast, where the moon will set before it enters the dark umbra. 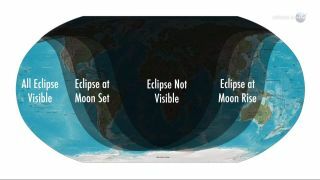 Most viewers in the Pacific Time Zone, however, should be able to see a considerable portion of the two-hour eclipse.